Pete Gaffney knows his pop culture, more specifically sports and most specifically the 1960s thru the 1980s — and he’s a lover of nostalgia. Those years features prominently on his podcast Rewind: The Podcast, which can be found on iTunes. And while he’s only started creating these podcasts (there are 8 as of today), he’s already created nearly eight hours of wonderful and interesting backstories. With co-host Adam Victor, Pete takes us through audio clips that immediately trigger a particular time (like the Life Cereal “Hey Mikey” commercial) and then exploring the story behind the story. Gaffney kicks off the series with a piece on the music of 1968. Though he was only three years old at the time, Pete had older siblings who made sure eclectic music was ever present in the household. Songs like “Love is Blue” by Paul Mauriat mixed with songs by The Beatles, Cream, Glenn Campbell and Simon & Garfunkel gave the year a wide variety of musical influence, and he and Victor take us through the meaning and impact of these songs. Most notably, this year marked the transition of music from the poppy and orchestral Herb Albert releases, to the growing popularity and harder rock of Cream. Later he jumps to “The TV of 1978”, commenting on how the three major networks (ABC, CBS, NBC) had a goal of creating “the least objectionable television.” In other words, the networks weren’t as much interested in pleasing the greatest number of viewers as much as offending the least number viewers. In other words, because there were only three networks and no remote controls, people would tend to stay tuned to the same network all evening as long as the shows followed a predictable formula. Think The Love Boat followed by Fantasy Island. Or how about Tuesday nights with Happy Days followed by Laverne and Shirley then Three’s Company and finally Taxi – a near perfect lineup. Pete then takes the same year and jumps to the big screen, discussing the movies of 1978 in “Just When You Thought It Was Safe to Go Back to the Movies.” That year begat Grease, Animal House, the original Halloween, Coming Home, The Deer Hunter, and Superman – all blockbusters, all memorable and many pivotal. Halloween launched the slasher movie genre which was copied many times, not just in its many sequels. 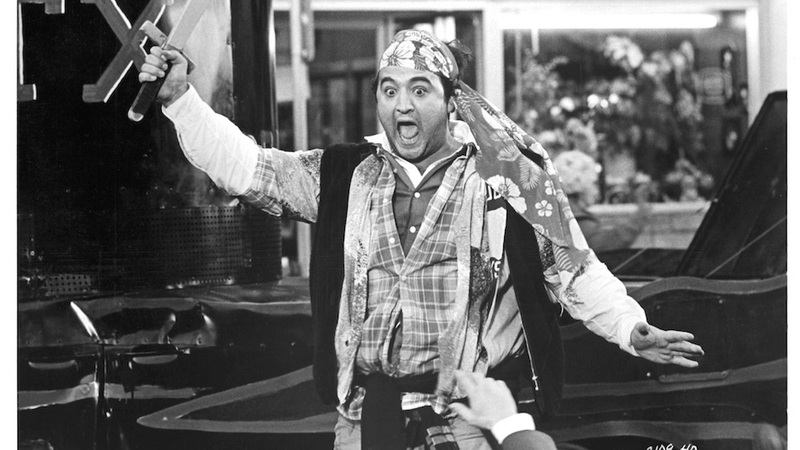 Animal House defined the perception of fraternities for a generation and set a tone for comedy movies for the decade. Pete and Adam take us through how Superman was the start of the super-hero movie craze that’s really picked up in the last ten years and discuss which Superman actor was the best. In his “holiday special” podcast, Pete explains “How Star Wars Saved Christmas”, and comments on the disturbing plot and questionable moral message of the Rankin Bass TV show Rudolph the Red-Nosed Reindeer. The podcast goes on to discuss holiday TV shows, including the infamous Star Wars Holiday Special. When discussing favorite Christmas gifts of 1977, he reminisces about the Coleco hand-held football game, where many of us spent hours staring at those little red LED players. As he does with other topics across his podcasts, he and Adam Victor walk through the most popular songs, movies, foods, songs, and toys from that year providing hilarious commentary along the way, including Pete confiding that his wedding song was “The Christmas Song” by Nat King Cole. Later in the series, he jumps to 1988 to cover the blockbuster movies released in that year, including Coming to America, Roger Rabbit, Rain Man, A Fish Called Wanda, Big, Nightmare on Elm Street, and the classic holiday hit Die Hard. Beyond just Pete and Adam riffing about memorable popular culture, the two also add engaging interviews with guests such as with filmmaker Kyle Newman (Revenge of the Nerds, The Hollow), Aisha Harris, assistant pop culture editor at the New York Times, and Richard LaGravenese, screenwriter and director (The Fisher King, The Bridges of Madison County). If a song, TV show or movie immediately takes you to a time and place of your youth, you’ll experience this feeling over and over throughout this podcast series. Add Pete Gaffney and Adam Victor and you’ll not only spend hours reminiscing but also chuckling about our shared pop culture memories.